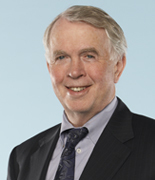 ﻿ Paterson MacDougall LLP - D. Bruce MacDougall, Q.C. Bruce MacDougall is a partner in the firm and is engaged in a general insurance defence practice, including representation of air and land carriers, professionals and products suppliers and manufacturers; technical claims, representation of primary and excess insurers and reinsurers. He is also engaged in the defence of defamation matters. Bruce is a well-respected member in the legal field, particularly in the areas of Aviation Law and Professional Liability and Indemnity. He has been honoured as one of only 50 Canadian members of the Federation of Defense & Corporate Counsel. He is also listed in the International Who’s Who of Business Lawyers, Aviation and in the Canadian L’Expert Directory in the areas of Aviation (Regulatory and Litigation) and Litigation (Defamation and Media). He received accreditation through the Stitt Feld Handy Group and practices as an arbitrator and mediator with ADR Chambers in Toronto. Bruce has published many works and presented topics in aviation law, insurance law and products liability.